The tf.estimator.Estimator is at the heart TenorFlow's high-level interface and is similar to Kera's Model API. It hides most of the boilerplate required to train a model: managing Sessions, writing summary statistics for TensorBoard, or saving and loading checkpoints. An Estimator has three main methods: train, evaluate, and predict. Each of these methods requires a callable input function as first argument that feeds the data to the estimator (more on that later). You can write your own custom model implementing the Estimator interface by passing a function returning an instance of tf.estimator.EstimatorSpec as first argument to tf.estimator.Estimator. The first argument – mode – is one of tf.estimator.ModeKeys.TRAIN, tf.estimator.ModeKeys.EVAL or tf.estimator.ModeKeys.PREDICT and determines which of the remaining values must be provided. loss: A Tensor containing a scalar loss value. train_op: An Op that runs one step of training. We can use the return value of tf.contrib.layers.optimize_loss here. loss: A scalar Tensor containing the loss on the validation data. eval_metric_ops: A dictionary that maps metric names to Tensors of metrics to calculate, typically, one of the tf.metrics functions. predictions: A dictionary that maps key names of your choice to Tensors containing the predictions from the model. An important difference to the Estimators included with TensorFlow is that we need to call relevant tf.summary functions in model_fn ourselves. However, the Estimator will take care of writing summaries to disk so we can inspect them in TenorBoard. The Autoencoder model is straightforward, it consists of two major parts: an encoder and an decoder. The encoder has an input layer (28*28 = 784 dimensions in the case of MNIST) and one or more hidden layers, decreasing in size. In the decoder, we reverse the operations of the encoder by blowing the output of the smallest hidden layer up to the size of the input (optionally, with hidden layers of increasing size in-between). The loss function computes the difference between the original image and the reconstructed image (the output of the decoder). Common loss functions are mean squared error and cross-entropy. where add_hidden_layer_summary adds a histogram of the activations and the fraction of non-zero activations to be displayed in TensorBoard. The latter is particularly useful when debugging networks with rectified linear units (ReLU). If too many hidden units return 0 values early during optimization, the model won't be able to learn anymore, in which case one would typically try to lower the learning rate or choose a different activation function. where slim.initializers.variance_scaling_initializer corresponds to the initialization of He et al., which is the current recommendation for networks with ReLU activations. This concludes the architecture of the autoencoder. Next, we need to implement the model_fn function passed to tf.estimator.Estimator as outlined above. The second line is needed to add the $\ell_2$-losses used in weight decay. $$ where $i$ is the current iteration. It would probably work as well without learning rate decay, but I included it for the sake of completeness. Note that we add a histogram of all trainable variables for TensorBoard in the last part. we would like to train it by calling train, which expects a callable that returns two tensors, one representing the input data and one the groundtruth data. The easiest way would be to use tf.estimator.inputs.numpy_input_fn, but instead I want to introduce TensorFlow's Dataset API, which is more generic. tf.data.Dataset represents a dataset and any transformations applied to it. tf.data.Iterator is used to extract elements from a Dataset. In particular, Iterator.get_next() returns the next element of a Dataset and typically is what is fed to an estimator. When creating input for evaluation or prediction, we are going to skip these two steps. """Hook to initialise data iterator after Session is created.""" """Initialise the iterator after the session has been created.""" To make things a little bit nicer, we create an InputFunction class which implements the __call__ method. Thus, it will behave like a function and we can pass it directly to tf.estimator.Estimator.train and related methods. A denoising autoencoder is slight variation on the autoencoder described above. The only difference is that input images are randomly corrupted before they are fed to the autoencoder (we still use the original, uncorrupted image to compute the loss). This acts as a form of regularization to avoid overfitting. 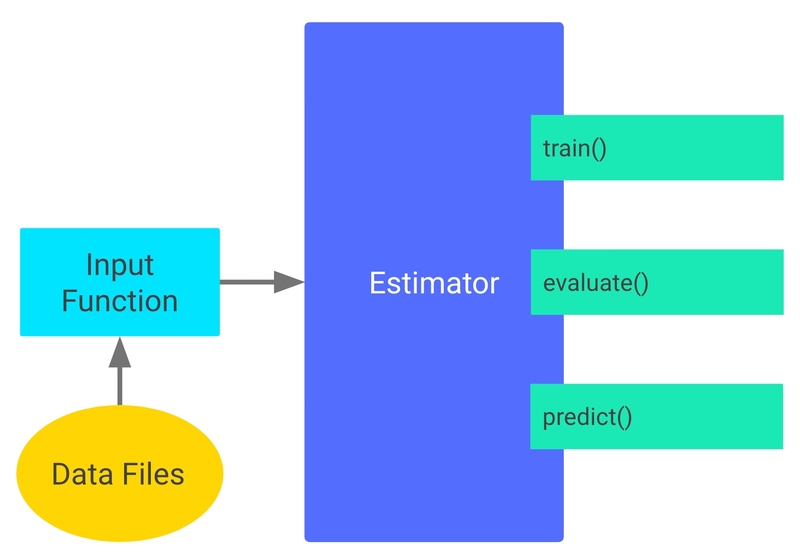 I hope this tutorial gave you some insight on how to implement a custom TensorFlow estimator and use the Dataset API. Update: Have a look at the second part on Convolutional Autoencoders. Thanks for the tutorial, more or less what I was looking for. I am left wondering how to access the latent representations in the Estimator framework though - any tips? Unfortunately, it seems that tf.slim is deprecated now.